Abu Dhabi (Agenzia Fides) - With a message of peace, fraternity and tolerance, Pope Francis arrived in Abu Dhabi, the capital of the United Arab Emirates (UAE). Pope Francis is the first pontiff to have embarked on the first-ever papal trip to the Arabian Peninsula (from 3 to 5 February 2019). As announced on the official Twitter account, the Pope visits the country "as a brother, in order to write a page of dialogue together, and to travel paths of peace together ". 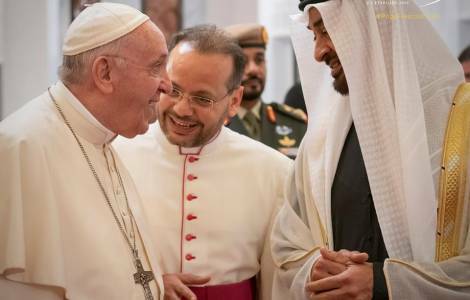 The visit of Pope Francis to the United Arab Emirates takes place under the theme of "Make me an instrument of peace" and calls for collaboration between peoples and religions, according to paths of dialogue, harmony and peaceful cooperation. His Highness Sheikh Mohamed bin Zayed Al Nahyan Crown Prince of Abu Dhabi, and Deputy Supreme Commander of the UAE Armed Forces, and Ahmad Al Tayyeb, Grand Imam of Al Azhar Al Sharif along with other officials and a large group of children welcomed Pope Francis with bunches of roses. Mohamed Bin Zayed said: "This visit is particularly important in promoting the values of fraternity, peace and peaceful coexistence. The visit is also significant because it strengthens the bonds of friendship and cooperation between the United Arab Emirates and the Vatican". He also said: "The Emirates have been, and will continue to be, a beacon of tolerance, moderation and coexistence, a key player in the dialogue between civilizations and cultures, and will continue to oppose intolerance and extremism, regardless of its origin, embodying the highest human values. He then observed: "Pope Francis and the Great Imam are universally appreciated and respected for their great role in promoting humanity, dialogue and understanding, in rejecting conflicts and wars and promoting coexistence between people of various religions, cultures and ethnicities". The year 2019 - he recalled – has been proclaimed the "Year of tolerance" to make the United Arab Emirates a place that promotes "initiatives of civil society in support of human fraternity", recalling that in the United Arab Emirates there are three monotheistic faiths and "people have lived in harmony and peace for centuries". "The Arab region is home to millions of people who believe in coexistence and dialogue and renounce violence and extremism", he concluded. Pope Francis is accompanied, among others, by Cardinal Pietro Parolin, Secretary of the Vatican State, by Cardinal Leonardo Sandri, Prefect of the Congregation for the Oriental Churches, by Cardinal Fernando Filoni, Prefect of the Congregation for the Evangelization of Peoples.